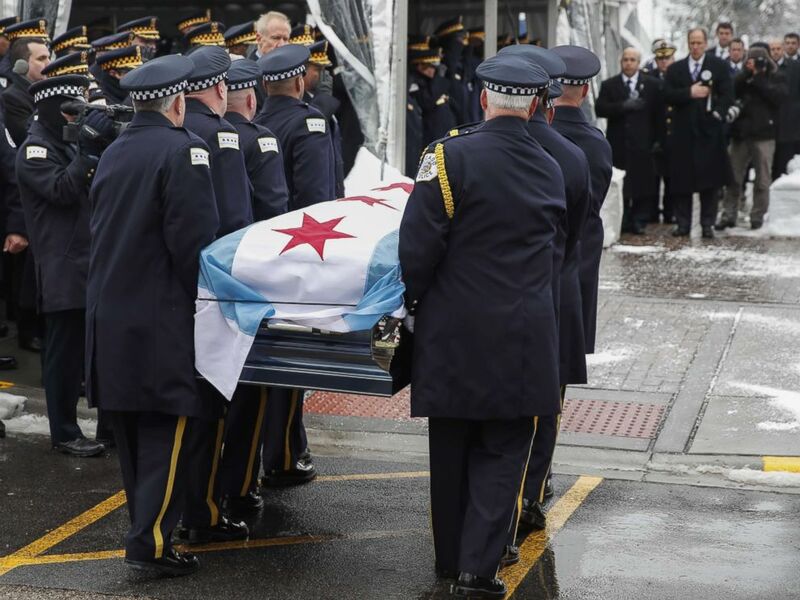 The mayor of Chicago, governor of Illinois and a sea of uniformed officers were among those who gathered on a cold, snowy Monday for the funeral for a young Chicago police officer killed in the line of duty. Officer Samuel Jimenez, 28, was fatally shot in the neck while trying to protect employees and patients during a shooting at Chicago's Mercy Hospital on Nov. 19, police said. "He was just doing what came natural to him. He stepped into action because he sensed people were in danger," Chicago Police Superintendent Eddie Johnson said at the funeral service. 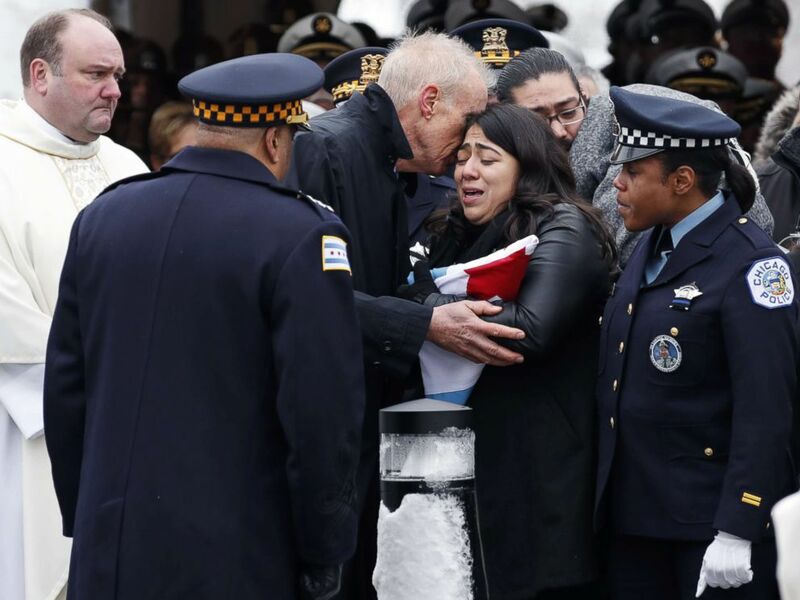 Illinois Governor Bruce Rauner comforts Crystal Garcia, the wife of slain Chicago Police Officer Samuel Jimenez, during funeral services at the Chapel of St Joseph at Shrine of Our Lady of Guadalupe on Nov. 26, 2018 in Des Plaines, Ill.
"He heard the call on the radio and saw the tremendous police response, those officers rushing to the aid of the injured to defend the defenseless in a despicable act of violence," said Johnson. "No doubt that if it wasn't for Officer Jimenez and the brave men and women who ran alongside him that day, countless numbers of additional lives would have been lost or affected." "He was a hero," Johnson said, adding that Jimenez "made the ultimate sacrifice." Hundreds of police officers attend the funeral for the Chicago Police Officer Samuel Jimenez at the Chapel of St Joseph at Shrine of Our Lady of Guadalupe on Nov. 26, 2018 in Des Plaines, Ill.
Jimenez is survived by his wife and three children. Johnson vowed to always be there for them, "from birthday to graduations." To Jimenez, Johnson said: "I know you're watching. Many Chicagoans were saved because of you. Thank you so much for your dedication, commitment and sacrifice... Sam, may you rest in peace." 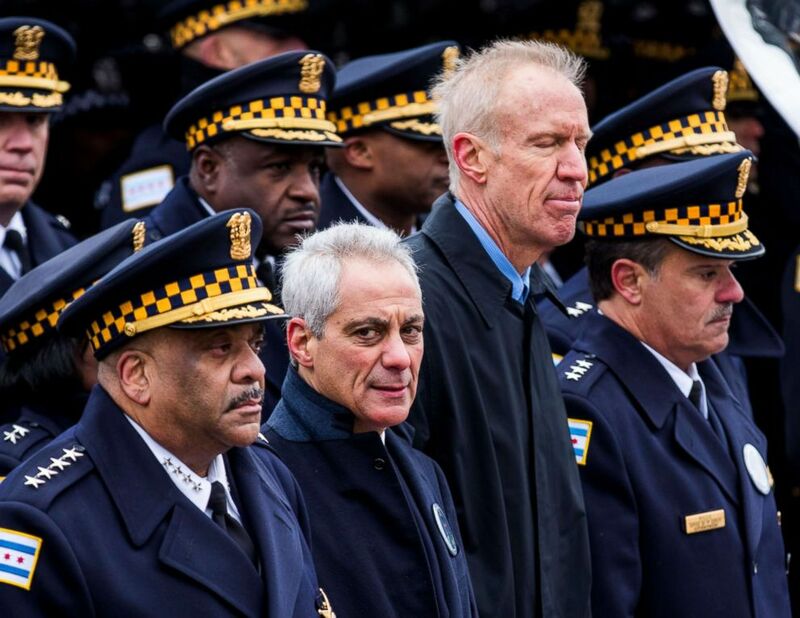 Chicago Mayor Rahm Emanuel stands with Chicago Police Superintendent Eddie Johnson, left, and Illinois Governor Bruce Rauner at funeral services for Chicago Police Officer Samuel Jimenez in Des Plaines, Ill., Nov. 26, 2018. The casket of slain Chicago Police Officer Samuel Jimenez is carried by fellow officers to the Chapel of St Joseph at Shrine of Our Lady of Guadalupe on Nov. 26, 2018 in Des Plaines, Ill.
Chicago police officer Rafael Villegas, overcome with emotion, said Jimenez "was one true friend." The two met in the Chicago Police Academy in February 2017, Villegas said. 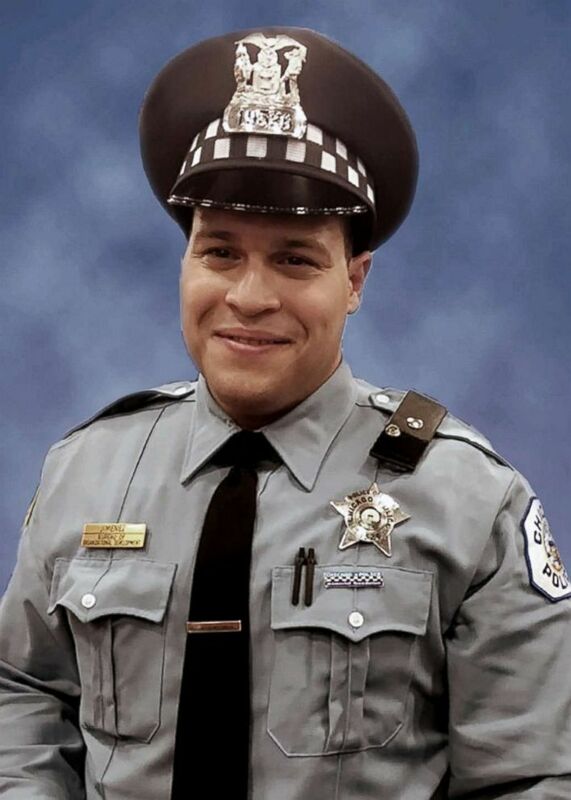 Jimenez served on the force for nearly two years, The Chicago Tribune reported. "When he spoke about his amazing wife, Crystal, just the sound of his mentioning her name spoke volumes. His eyes would light up any time you asked about his lovely kids," Villegas said. "His family was his driving force." Jimenez was a "hard working man," Villagas said, who previously worked at Dunkin' Donuts, bussing tables and delivering mail. Villegas called his fallen friend a "loving husband, father, son and friend, and lastly a heck of a police officer." The suspected gunman who murdered Jimenez also killed hospital emergency department physician Tamara O'Neal, 38, and Dayna Less, 24, a first-year pharmacy resident-in-training, according to police. O'Neal had recently broken off her engagement with the suspected gunman, Juan Lopez, who came to the hospital to take the ring back, according to police. Lopez also died in the shooting. CPD Officer Samuel Jimenez is seen here in this undated file photo. 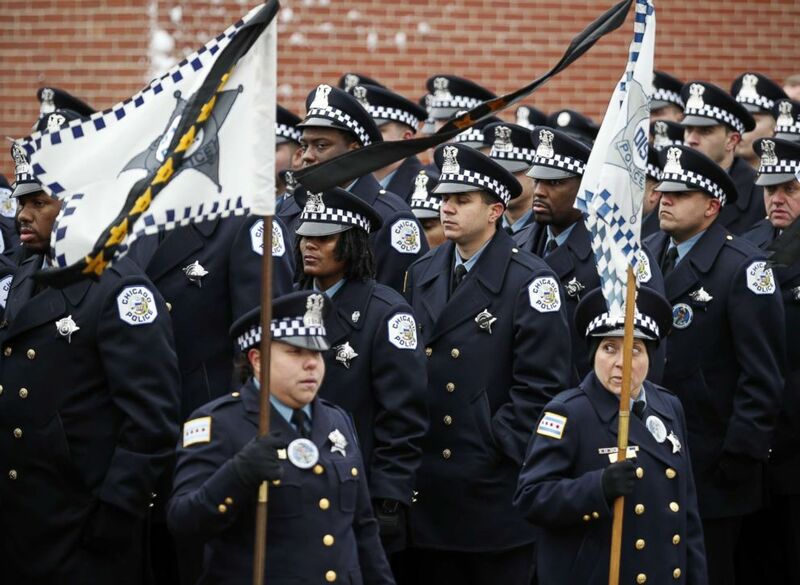 To the officers gathered at the service, Rauner called their job the "most notable calling of all humanity. We owe you an incredible debt of gratitude. It is an honor for me to serve you." Chicago Mayor Rahm Emanuel also spoke at the service, calling Jimenez "someone the entire city of Chicago will always look up to."